In 2007, Mark was diagnosed with a rare eye condition, Stargardt Macular Dystrophy - eighteen months later he was legally blind. 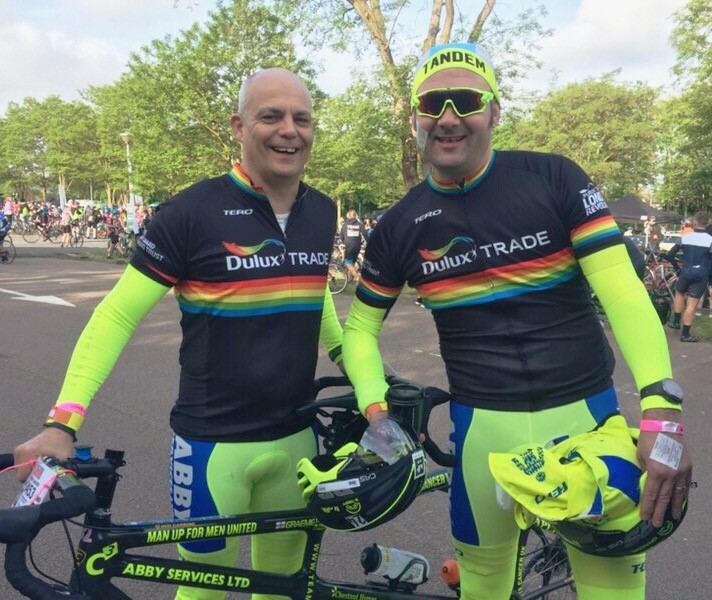 Mark started tandem cycling in 2012 with a friend, Graeme Chilvers, after being inspired by Bradley Wiggins’s win of the 2012 Tour de France. Mark and Graeme since completed many challenges, including cycling from London to Paris and cycling 977 miles over 5 days. I first got into cycling when Team Sky formed and followed religiously, willing a British cyclist to win the tour. I also cycled 977 miles in 5 days on a turbo trainer in Dulux reception to replicate what my colleagues were doing as a team from our company Akzo Nobel, as they rode across Britain. Team Daisy started the following year in 2016 when the company sponsored the London Revolution, I was challenged to ride on a tandem and have not looked back since. I am going to cheat and have two. First is Niki Lauda to suffer such a horrific accident and be given your last rights and to come back and win another world title, to have the confidence to stand up for beliefs against your peers. Secondly Sir Bradley Wiggins who’s success got me off my backside, out of a dark hole after losing my eyesight and into the saddle. This was a major turning point in getting my life back on track. I have been lucky enough to meet them both. How do you manage your visual impairment during cycling? It’s difficult to communicate whilst on the tandem especially on descents and in headwinds. Graeme and I have a set of touch signals, mount and dismount procedures that we have developed over the last two years. We now use an intercom which enables Graeme to let me know what’s coming up ahead. Not sure he is always accurate as some of the 100 metre climb calls seem an awful lot longer. There is a massive element of trust in Graeme. What is your biggest motivation to keep taking on cycling races and challenges? Firstly being able to help people less fortunate than myself, by raising money and awareness for charity and to inspire as many other people with disabilities to believe in themselves and have a go. Personally it gives me a focus, a purpose and making my family proud of my achievements. Can you explain the differences of cycling long distances on a tandem as opposed to cycling alone? It’s been a long time since I rode a bike on my own, being that close to someone’s backside is the first difference LOL. In general it’s a lot harder especially climbs because of the extra weight, everyone assumes it’s going to be easier with two but it’s far from it. You have to cycle at the same cadence, rhythm and same gear, think like one. You even have to take water at the same time get out of the saddle at the same time to stretch. Little things like you have to unclip and dismount at the same time and on the same side. Climbing you have to remain in the saddle, if one stops peddling without telling the other you’re on the deck. In general we are longer in the saddle on a 100 mile sportive sometimes up to 2 hours depending on the climbs. You never get tired at the same time so supporting each other throughout the ride is key. From Graeme: The difference of riding a tandem to a solo bike. There is a different set of skills/techniques required, the tandem tends to swerve around as you have 2 people riding with differing capability. Climbing is a real challenge as a result of this so does take an enormous of effort. Also being relatively new to this and with Mark’s sight, getting out of the saddle to give a small boost and to stretch the legs is difficult or even impossible. We do get compensation for this on a good flat or a downhill ride. Our weight and power enables us to get a good shift on. As the Captain I have had to work hard to earn Mark’s confidence as he relies on me for everything out on the road, braking, gear changing, giving a running commentary of what we are riding into whether it be hills, bumps in the road, climbs, gear changes…everything. 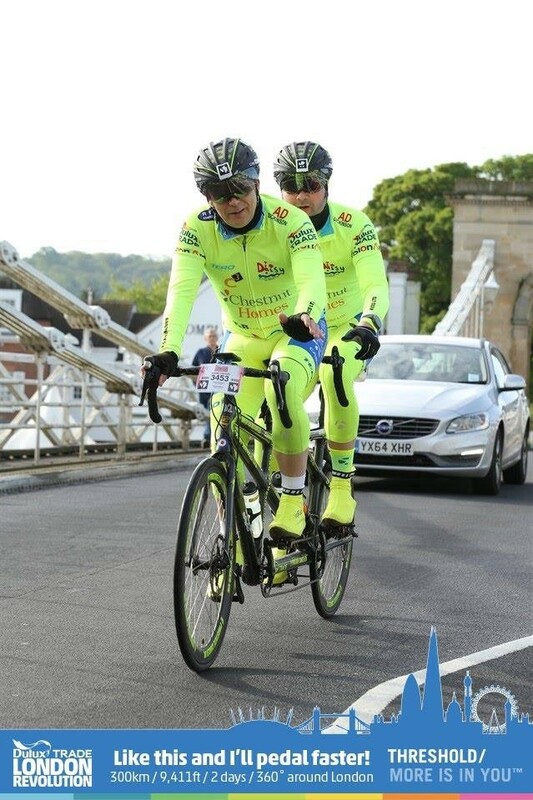 The beauty of the tandem is that it allows Mark to get out on the open ride doing something he could not otherwise participate in experiencing challenges that would otherwise be impossible. It is also good fun as you have a constant ride buddy to have a laugh and joke with. What advice do you have for someone with a visual impairment who is considering taking up cycling or any sport? Just get on and do it you will never look back. Get in contact with myself and the team at JD Tandems to get you started. Proper advice is invaluable; it would be fantastic to expand Team Daisy. If I can do it anyone can. We have a solid events program again in 2019 with high profile events so to finish them all and continue our record of cycling up every climb. Most importantly to enjoy what we do, raising as much as we can for charity and welcome any new sponsors on board to help achieve this. Get to know the foods that suit you best both before and during a ride. My performance on the bike on long sportive has improved with Beet it as part of the program; More energy during the ride with less fatigue. The introduction of Turmeric Zinger has helped with greater recovery times both after an event and more importantly after each Watt Bike session. The ginger zinger works well for nausea on rides when taking a lot of gels and bars. A cheat is to freeze it the night before, that keeps it cooler for the ride. For me personally to start with I did not like the taste of beet it shots but persevered with it and reaped the benefits. Stick with it…. it’s worth it.